In the last decades we have seen a transformation of our reality, each day more and more influenced and linked to the digital world. No one doubts that we are experiencing a profound change that, supported by new technologies in a massive way, offers us great opportunities and challenges. We could say that mobile devices and the internet have been the two key elements that - as the printing appearance caused, or later other mass media, such as radio or television - reaches absolutely all the spheres of our lives: communication, information, entertainment, commerce, the provision of education, health and government services, and the production systems themselves. These elements not only provide new tools, but also influence our position in the world, in our role as citizens. Thus, although the concept of "digital citizen" was initially created to define those people who were active on the Internet and who used it to interact with their public administrations or collaborate with social and political entities, this idea become obsolete, and it is now clear that digital citizenship is no longer a matter of choice, but there is a digital space in which all citizens must be present. EILEEN stands for Enhancing Intercultural Learning in European Enterprises. EILEEN is a 2-year project funded by ERASMUS+, which seeks to promote intercultural competences and a welcome culture in enterprises. The EU is making significant efforts to eliminate the barriers to labour mobility. However, most of the enterprises in European countries do not necessarily have the essential intercultural know-how for receiving employers with a different cultural background. At the same time, often the foreign employees are not ready to face the challenge of working in a different country, and encounter difficulties in identifying the new cultural paradigms, accepting the differences and acquiring cultural knowledge. The “Combat Bullying: A Whole School Program” (ComBuS) project aims to promote learning (face-to-face plus online and mobile methodologies, tools and activities) on how to combat bullying and create healthy and safe school communities for students, teachers, school staff, school leaders and parents. The project is aimed to define an European pathway on rural women entrepreneurs that improves entrepreneurial skills and competences empowering women of rural areas. Europe has achieved gender parity in education attainment, but women still remain under-represented in key, growth-enhancing fields of education such as science, technology, engineering and mathematics. Labour markets also exhibit many “gender gaps”. Women are less likely to work for pay, and are more likely to have lower hourly earnings, do more unpaid housework than men. The proportion of female entrepreneurs, at 33% (Labour Survey 2013) (30% in start-ups), is some way short of optimum and most women still do not consider entrepreneurship as a relevant career option. The implementation of European directive on self-employed women should remove a major barrier to female entrepreneurship. But the difference still. LLWINGS aims at promoting a new vision of school as the bridge to lifelong learning and active citizenship, through a focus on learning-to-learn competences and joy to learn as the very WINGS for lifelong learning. LLWings in particular aims to support teachers as the leading actors of bottom-up school innovation in translating the "learning to Learn" goal into practice and daily enhance joy and motivation to learn among their students. This was done by identifying and promoting those teacher competences which are key to transform school in a learning environment built around the learner and open to the territory and its non-formal and informal learning opportunities, so to make the learning process meaningful and relevant, and its sense "owned" by the student. This project aimed at organisations from the Employability sector and the Adult Education/Training sectors. The project provided information on how to engage with and support Ethnic Minority groups and Migrants into employment through job shadowing, work placement, employer engagement and vocational language training and employability skills development. The results included a Research Report from each partner country detailing target groups and employment sectors; examples of the transferred materials from the project (Skills Audit Toolkit, Vocational Language Course, Study Skills Course, Empowerment Course and Equipped For the Future Course);feedback from beneficiaries and trainers. The products from the project will be integrated into core activities of partner organisations. The REINICIAL project offers tools for supporting unemployed people +45 years old and educational resources for training professionals who work in outplacement, job insertion and training programs devoted to this collective. The project’s aim is to transfer best practices about labour insertion for workers and professionals over 45 years old that have lost their job: the so called “senior” group. InRuTou aims at developing and testing a set of tools and innovative models for facilitating the development of sustainable tourism in rural areas, specifically in mountainous regions, by fostering a community consultation process, and for training selected opinion leaders to act as multipliers in enhancing community tourism planning via training existing and new local tourism operators, with various degrees of experience, professional and educational background. Farm Inc. addresses the issue of competiveness at farm level and aims to strengthen the competitiveness of agricultural SMEs as well as to improve the quality of continuous vocational training and the acquisition of skills for the agricultural sector. More specifically, Farm Inc. introduces the concept of an innovative marketing strategy to the agricultural community (farmers and farmer associations) in order to increase the bargaining power of small producers in the existing food chain and to open new market possibilities. The main aim of Bazaar is to promote language learning and at the same time the exchange experiences, knowledge and ideas amongst adult learners with a migrant background. Bazaar stands for ‘Learn and Exchange at the Market Place’ and is co-funded by the Lifelong Learning Programme of the European Commission. The PLENTIS project is developing a set of online educational minigames on the topic of agricultural entrepreneurship, in order to develop the entrepreneurial skills and competences of vocational students. According to the Lisbon Strategy, one of the 8 key competences is the ability for entrepreneurship. As entrepreneurship cannot be identified as one competence, but as a set of competences, the PLENTIS project aims to develop an online educational platform, which is basically a gamified competence development land (literally), with actual content (knowledge base) and individual games to help teachers and students develop those skills and competences essential for entrepreneurship. The Plentis project is funded by the European Commission’s Erasmus + programme. The project started in September 2014 and lasts for 2 years. The main field of the project is to develop an online game based learning platform and a supporting teachers’ handbook in the topic of agricultural entrepreneurship development. The CommonS project aims at the development of Common Spaces, an international co-learning and e-mentoring Community of Practice (CoP) dedicated to improving the employability skills and work opportunities of participants and reducing the gap existing between the academic world and the labour market, by means of appropriately remixed and localised OERs, i.e. Open Educational Resources freely available to everyone. In many European countries migrant youths or young people from ethnic minorities do not have any role models in future-oriented fields throughout their job careers, neither within their families nor in their social contexts. If at all, they tend to take up traditional job trainings and jobs, as they and their families do not consider other options for various reasons. Therefore it is considered crucial to offer youngsters mentors from their own ethnic communities who accompany them on their way to a successful VET and job career. Mentors are meant to support these youngsters as a role model in the education and training phase which is vital for their future career. It is considered crucial to offer youngsters mentors from their own ethnic communities who accompany them on their way to a successful VET and job career. European Public Employment Services (PES) are key agents in supporting Europe’s strategic goal of high levels of employability during a period of economic turbulence and demographic change. The increased demands on these public services have precipitated a need for transformation and continuous development. For managers and practitioners to perform successfully in their job and to support their own, and their clients’/claimants’, career adaptability and resilience, they each need to acquire a set of new transversal skills and competencies, as well as embed a professional culture of continuous improvement. The strategic partnership will promote actions, at a national and international scale with the purpose of building contents, digital instruments and analyzing the impact of ICT in a global world. It will pay special attention to learners that have never used the Internet and with disadvantaged backgrounds. It aims to help people facing the process of civilizational change (social, political, economic, and cultural) and, consequently, to shape the needs of future generations. The MIGRANTS+ project aims at developing lifelong learning opportunities for adult emigrants in basic skills, developing the skills of training staff, administrative staff, who frequently deal with migrants, support staff of NGOs how to facilitate personal development and enhance the learning opportunities of migrants, enhance active participation of migrants in the host societies as equal members and preventing their marginalisation. 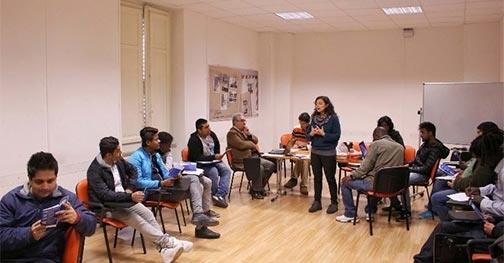 MIGRANTS+ has adapted and further developed the software tool produced by the FIL Leonardo project, which detects learning needs in basic skills such as numeracy, ict, use of internet, communication skills, human relations, occupational health and proposes users individualised training curricula. It has developed tests (pools of questions and respective set of curricula) for further skills, as language literacy (CZ, DE, EL, FR, IT, PL, TR), legislation (civil rights, employment laws and social security), knowledge of the culture of hosting country. An increasing number of VET teachers/trainers work as developers or project coordinators of transnational project work. They need more competence in the field of international projects planning, implementation and evaluation, but most of all a validation system recognising their competence and experience. A large part of this is acquired through non formal or informal learning. We seek to recognise and accredit this learning by creating an integrated European system. Tools to help the teachers to develop, mobilize and valorize the transversal competences in their learners requested by the companies acquired through informal learning. The project aims to develop a teaching tool that should help teachers to transfer tacit competences to VET students in accordance with the requirements of the industry in order to facilitate their access to the labour market. The focus is made on transversal competences.